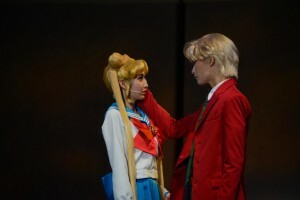 The final performance of the Sailor Moon Un Nouveau Voyage musical will be streamed online on Niconico October 4th. Viewers in Japan can watch it using this link. This is a paid broadcast which is limited to viewing in Japan only. I managed to watch the last musical online using this system though I have not had much luck watching content that is restricted by country lately. I’ll add some details on how to view it if I figure it out. This will be a Japanese only stream with no subtitles. It will be available to view time shifted until October 12th. Presale tickets are 2000 points, which equates to 2000 yen or $17 US, and will be available until October 2nd to purchase via the Niconico web site. 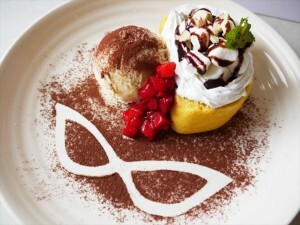 Day of tickets, available from October 4th to the 10th, will be 2500 points, which equates to 2500 yen or $21 US. Miss Dream has mentioned on their Facebook and Twitter pages that they will be recording the stream and putting together an English fan subbed version. Given their usual turnaround with subtitling things it should be available within about a week of the broadcast. Once this happens, I will be sure to mention it here. 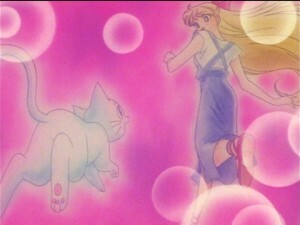 This week on Sailor Moon SuperS we get a couple of funny episodes that are all about romance. 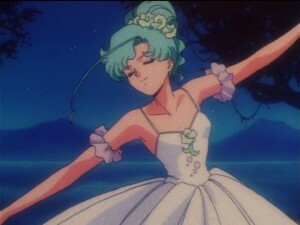 With this morning’s addition of episodes 144 and 145 to Hulu and Neon Alley we get Shingo’s final appearance as a pimp who falls in love with Ami and then it’s all about fat shaming Usagi as she tries to be a ballerina. Episode 144, Shining Summer Days: Ami Under the Sea-Breeze, ships Ami and Shingo. Isn’t Shingo great? Wasn’t it fun when they shipped him with his sister in the first season? We’ve come a long way since then as Shingo is now going after Ami! This is sadly the last time we see Shingo in the series. He was a fairly prominent character in the first season, having a smaller role in Sailor Moon R and since being seen only very occasionally. 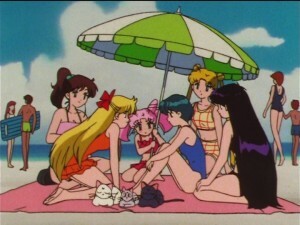 This is a good final episode for him with some great moments, such as where he pretends to be a pimp in order to discourage gentlemen callers from hitting on Usagi and her friends at the beach. When Ami shows up Shingo suddenly gets excited and needs to run off. Why is this? Perhaps he, in nothing but his bathing suit, feels that there is a level of excitement that he can’t quite hide. 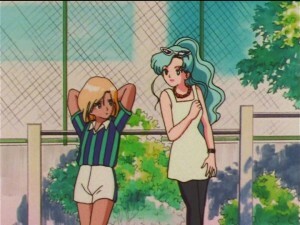 Tiger’s Eye tries to hit on Ami and as usual doesn’t do so well. He takes it quite poorly when Shingo seems to be the one getting in his way. He tries to drown him, expecting Ami to simply ignore him, but that doesn’t work and we get an excuse for a little Ami and Shingo mouth to mouth. This is yet another swimsuit episode. We seem to get about one a season so this is what we have for SuperS! 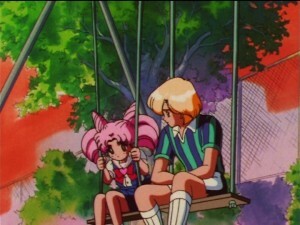 One interesting relationship in this episode is Shingo and Chibiusa. 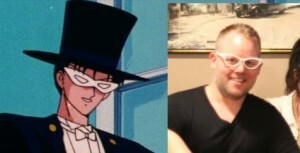 Shingo doesn’t know that Chibiusa is his niece. Presumably he doesn’t die in the next 6 or so years and will actually properly get to be her uncle. He believes her to be his cousin but treats her more like a sister as they are living together. All around this episode is good for some laughs. Shingo was always a great character and it’s too bad we won’t be seeing him anymore. 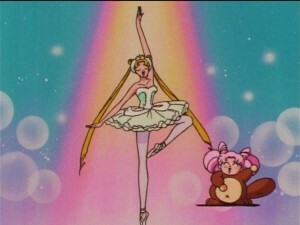 Episode 145, Become a Prima: Usagi’s Ballet, has Usagi and her friends trying out ballet. The centres around a performance of the ballet Giselle. 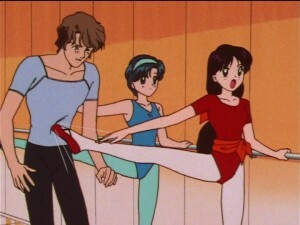 The target is a ballet teacher Yamagishi and his Prima Ballerina Kiriko who inexplicably looks a lot like Naru. He wants her to be Giselle but thinks she is missing something. Enter Fish Eye, in drag once again because Yamagishi is straight, blowing everyone away with his ballet moves. It seems like Yamagishi has picked him to be Giselle but it turns out this was more of a weird semi cruel motivational tool to get the most out of Kiriko. A recurring theme in this episode is fat shaming Usagi, who is ridiculously skinny. It’s like the way Usagi is animated doesn’t match the way she is actually supposed to look in the narrative in the show. Or perhaps it’s just logistics that in a show where everyone is equally skinny no one is actually skinny since it’s the new normal. Either way, Usagi has little bits of fat which do a sort of muffin top thing over a tutu whenever she wears one. Chibiusa teases her about this at first which is funny because as Usagi’s daughter she has already made changes to her waistline in the future. Later in the episode the monster puts a Tutu on the two of them and the waistline problem is pointed out again. Mamoru even notices the weight gain as he’s accused of being too slow to save them. There’s just nothing good about any of this. It’s a negative attitude that tells viewers that they need to be really skinny and I just don’t like it. It’s official! 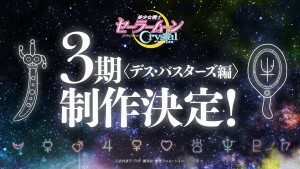 Following the airing of the final episode of Sailor Moon Crystal on Japanese TV a new set of episodes was announced. This was immediately confirmed on the Official Sailor Moon Site and Twitter account. The image included with this announcement shows Sailor Uranus’s Space Sword, Sailor Neptune’s Deep Aqua Mirror and symbols for all 10 Sailor Guardians. The Space Sword and Deep Aqua Mirror are two of the Talismans that have some importance in this next story arc. Missing is the third Talisman, Sailor Pluto’s Garnet Orb. I guess we’ve seen enough of it with the New Horizons photos of Pluto at this point. As expected this will cover the Infinity story arc for the manga which introduces us to Sailor Uranus, Sailor Neptune and Sailor Saturn as well as the enemies the Death Busters which includes Professor Tomoe, Kaolinite and the Witches 5. This is the equivalent to the Sailor Moon S season of the original Anime. Not a lot of details are included about the actual release schedule of these episodes. It seems likely that these episodes will once again be available to stream on Nicinico and to air on TV in Japan. We don’t yet know which of these will come first. Will we continue with the model of releasing online first, with a more traditional model of releasing on TV first or perhaps have a simultaneous TV and online release? We will have to wait and see as new details will be coming on the official site. The Infinity arc of the Sailor Moon manga covers 12 acts by the new manga chapter numbering which was used for Crystal. This will likely mean 12 episodes in this story arc. 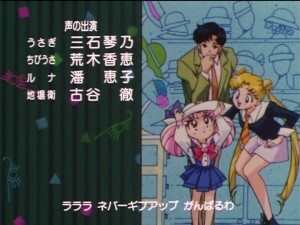 The Dream arc, which is the equivalent of the Sailor Moon SuperS season of the original anime, covers an additional 11 episodes. If another year of the show was coming we would likely get both of these arcs. 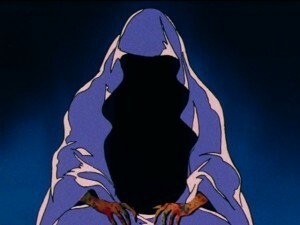 No such details were included in the press release which is no surprise as the Black Moon arc was not announced until late in the Dark Kingdom story arc of Crystal. At this point we don’t know how many more episodes are being planned. If we get that number we should be able to make a reasonable prediction about how many arcs that will cover. The Japanese announcements are breaking the story arcs into phases, with the Black Moon episodes being referred to as the second phase and this as the 3rd phase. Some also use the term season though with the first year of Sailor Moon Crystal covering two story arcs and arguably being considered one season this naming convention can be a bit confusing. Is this season 2, the second year of the show, or season 3, the third arc of the show? Is the term season even relevant to a show who’s primary method of distribution was online? The press release also noted that a rebroadcast of Sailor Moon Crystal will begin next Monday starting with the Dark Kingdom arc. Note that all but the first image in this post include art from the original Sailor Moon anime and not Sailor Moon Crystal. Voice actors from the original and new English dub of Sailor Moon will be appearing at Anime Weekend Atlanta this weekend, September 24th to the 27th in Atlanta, Georgia. The event will include Linda Ballantyne, the third voice of Sailor Moon and Toby Proctor, the second voice of Tuxedo Mask, both from the original English dub of Sailor Moon. Also in attendance will be Stephanie Sheh, the new voice of Sailor Moon in Viz’s English dub of Sailor Moon and the upcoming Sailor Moon Crystal dub. When is the last time two voices of Sailor Moon were at the same convention? It was at Otakon 2014. The 4 day convention starts today so if you are in the area be sure not to miss it. For more information check out the Anime Weekend Atlanta web site. 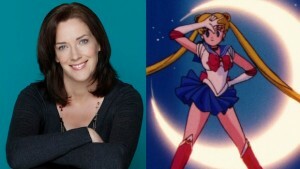 Another guest has joined the Toronto Sailor Moon Celebration taking place at the Ontario Science Centre this Sunday. Tony Daniels, the voice of Jadeite and Wise Man, also played a lot of smaller roles in the series. This one day convention will also include Roland Parliament, voice director of the first 65 episodes and the voice of Melvin, Ron Rubin, the voice of Artemis, and Jill Frappier, the voice of Luna and Susan Roman, the voice of Sailor Jupiter. 4:00 pm	So You Want To Be a Voice Actor? Advice for Aspiring Actors. This event is looking to be a lot of fun and I hope to see some of you there. For more information check out Moon Chase! and the Facebook page for the event. 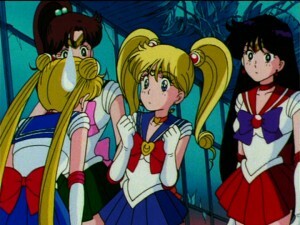 The two latest episodes of Sailor Moon SuperS were added to Hulu and Neon Alley this morning. With the addition of episodes 142 and 143 we are introduced to what seem to be the oldest and youngest targets in the series. 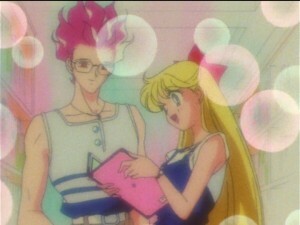 First we learn why Mamoru goes after school girls as he and Hawk’s Eye fail to seduce an elderly woman and next Fish Eye goes after a young boy who has his eye on Chibiusa. Also some new outfits. Episode 142, The Secret Mansion: a Menu of Love for You, reminds me of a fake movie in Married With Children called “Old Man, Older Woman”. We so rarely see love stories about older people so this episode was a nice change. Early in the episode we are introduced to an elderly woman Mayako. 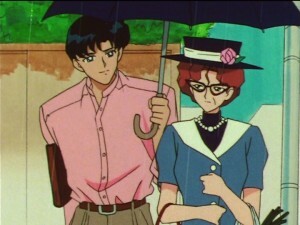 She fights to get a deal at the grocery store and then Mamoru offers to help her cross the street, but she rejects his advances. Mamoru’s charm works quite well on Usagi and Rei or even, as we saw early this season, on fellow University aged girls, but it looks like he’s powerless against an older woman! No wonder his preferences skew more towards what Tiger’s Eye is in to. Diana, mad that Mamoru was shot down, investigates and is fed some delicious stew by Mayako. 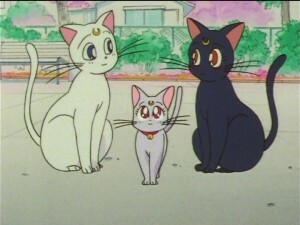 Do the cats in the Sailor Moon world prefer people food or cat food? 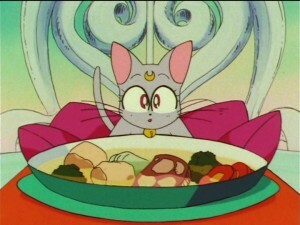 We see them eat cat food and other foods which usually appeal to cats, like fish, a number of times, but Luna also has more sophisticated taste such as when she eats Star Candies in the Sailor Moon S movie. So complex. Anyway it turns out this grouchy old lady is just miffed because her lover, Ichirou Ohno, who happens to have just returned to town, left to become the best French cook instead of opening a restaurant with her. Naturally all of this works out by the end of the episode and everything will probably be fine, except for the fact that they both wasted their youth being stubborn. That’s cool though because they open up a restaurant where they can serve great stew and other French food made by a Japanese guy. Hawk’s Eye is naturally the one to target Mayako, as he always has a preference for older women. Though no specific ages are generally given Mayako seems to be the oldest woman ever targeted in the SuperS series. For some reason he wears a shirt which looks like the flag of Turkey in this episode, though Turkey’s flag is a white moon and star, and his shirt has a yellow moon and star on a red background. What’s what about? This episode is somewhat of a retelling of the story of *batteries not included. In this film, which also has robots, Jessica Tandy’s character and the rest of the main cast live in an apartment block which needs to be sold in order to build some fancy new building. Thugery is used to try to kick them out. Similarly in this episode Mayako’s mansion is wanted by many but she refuses to sell. Thugs show up trying to force her out! For more on the hit film *batteries not included watch this video I made about the robots in the movie. It includes some fun props I made in the style of those robots. Episode 143, Believe in Pegasus: The Four Guardians’ Super Transformation, is about a lot of things that are more interesting that the Super Transformations. 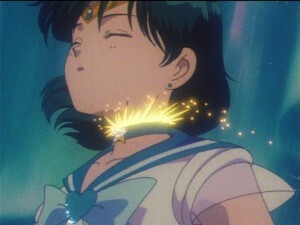 Yes there’s a thing with Pegasus and he does a thing to Sailor Mercury, Mars, Jupiter and Venus to give them little transparent shoulder things which doesn’t have much significance other that further complicating the view of the future we saw in Sailor Moon R. They will all later have individual episodes where we see them “power up” again so this is really a non issue. 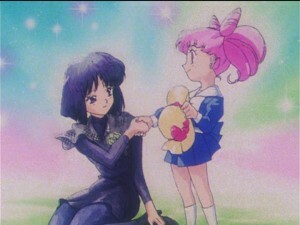 Speaking of powering up, is Chibiusa’s friend the Green Power Ranger? 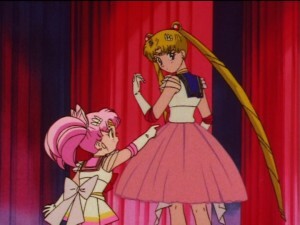 In a scene early in this episode we see a young girl, Aki, teasing Chibiusa. 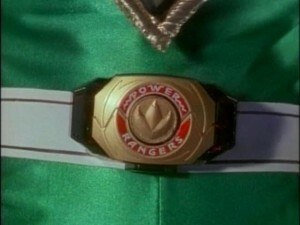 She has a logo on her shirt which looks a lot like the the Green Power Ranger’s Power Coin, the symbol of the Dragonzord. 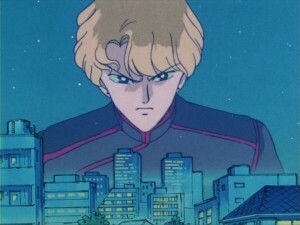 This week’s target is Robert, a young boy who has a crush on Chibiusa. Most kids don’t do anything about their crushes but Robert is, as the narrative of the story tries to tell us, a very appealing boy who can get anyone. He aggressively pursues Chibiusa but as we’re starting to figure out, she only has room in her heart for Pegasus. Fish Eye targets Robert. To date Fish Eye has targeted adult men but here he is targeting a child, something similar to what Tiger’s Eye did with the samurai girl Hiharu. It’s not clearly indicated but Robert could be even younger than her. Regardless of gender, this just seems inappropriate. Fish Eye, dressed as a woman as he does when targeting straight men and boys, is quickly turned down by Robert who sees her as an old lady. Good for your Robert! 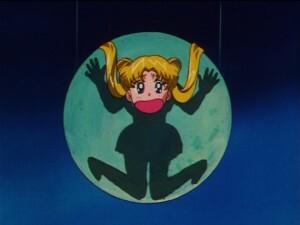 In a joke at the end of the episode we learn that Usagi has stood up Mamoru in order to spy on her daughter. The movie he’s waiting to see is Godzilla. This is the second time we’ve seen this movie showcased, the last being only 3 episodes ago with episode 141 when Minako went to see a movie with Hawk’s Eye. In both cases this poster for Godzilla was clearly shown. So what is going on here? Can this be a reference to any real movie out at the time? The two sightings of this poster, in episodes 141 and 143, had air dates of July 8th and July 22nd 1995. There were no Godzilla movies in theatres at the time. Godzilla vs. Space Godzilla was released on November 10th 1994, too early to still be in theatres the next summer, while Godzilla vs. Destroyer would come out later that year on December 9th 1995. Surely some smaller theatres could conceivably have run a rerelease of Godzilla in some limited capacity, but to have them run two weeks apart like this and be chosen to be seen by multiple characters in the series seems somewhat unlikely. Of course the real reason this is here is likely simply that somehow who made these episodes was a fan. 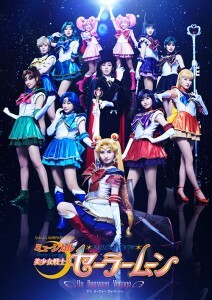 The new Sailor Moon musical, Sailor Moon Un Nouveau Voyage, began playing today in Japan. The show will run from September 18th to the 25th and then from October 2nd to the 4th. Though the show played in the evening that was in the past in Japan because of this mysterious thing we have call time zones. 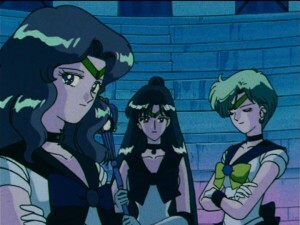 This musical covers the Infinity story arc, which includes the appearance of Haruka, Sailor Uranus, Michiru, Sailor Neptune and Hotaru, Sailor Saturn. The enemies are the Death Busters including Professor Tomoe, Kaolinite, the Witches 5 and Mistress 9. I don’t live in Japan so I haven’t seen the show yet though some images can be found at natalie.mu. I’ve included a few in this post but you should check out the full article for many more. I’ll have more thoughts on the musical once I actually see it. The DVD for this show, because we still aren’t doing Blu-Rays for musicals, will be available on February 24th in Japan for 7800 yen, about $65 US. As the announcement on the Sailor Moon official site indicates there will also be DVD rereleases of the first two new musicals, La Reconquista and Petite Étrangère. These will be available at the musical and include exclusive covers. The new covers are manga art by Naoko Takeuchi. This is not new art but rather art which was originally included on the jackets of the Sailor Moon Manga. 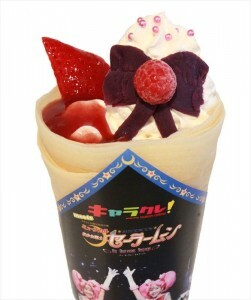 There are a lot of exclusive food and drink items available at the show including Sailor Moon themed Crepes and some Sailor Moon Drinks and deserts at the Terrace Café. Have you seen the musical? If so, what did you think? Keep reading for more images from this musical. 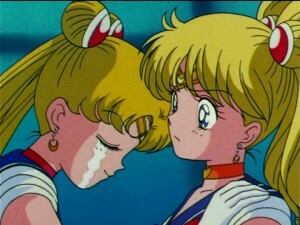 The two latest episodes of Sailor Moon SuperS were added to Hulu and Neon Alley this morning. This week we get episodes 140 and 141. 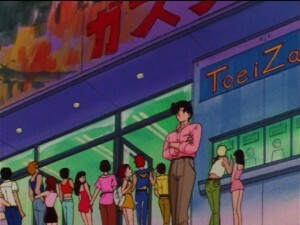 First Usagi befriends a fashion designer who is targeted by Fish Eye and then Minako tries to date two guys at the same time as she multitasks with Tiger’s Eye and Hawk’s Eye. 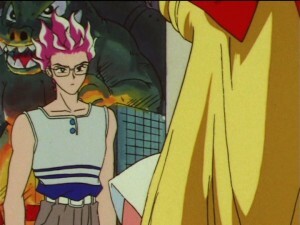 Episode 140, We Love Fashion: The Stylish Guardians, is all about fashion designer Yoshiki Usui. He’s doing a fashion show in town and all of the girls are instantly enthralled with his designs. 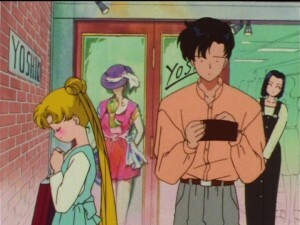 This is bad news for Mamoru because Usagi wants him to buy her his expensive clothes! Yoshiki Usui is a gay man, making him the target of Fish Eye. 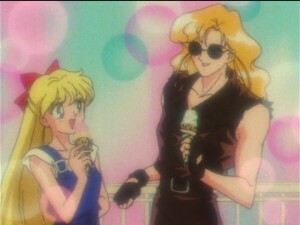 In the past, and in future episodes, Fish Eye dresses as a woman in order to lure the men he targets but in this episode he lures Yoshiki as a man. Yoshiki sees Fish Eye as a muse, which leads to him being dressed up in all sorts of great outfits and even stripping down to nothing! 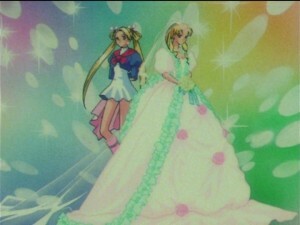 Usagi, being a bit shameless, asks Yoshiki if he can design her wedding dress for free. Is money an object when you are in the midst of ascending to the throne as world leader? Oh well. 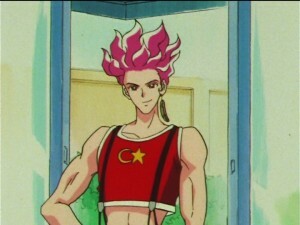 Ultimately as Yoshiki finds himself in the middle of the battle he sees the Sailor Guardians and inspires his next outfits by them. So what is the original inspiration for these items? Though the Sailor Guardians’ outfits seem inspired by modern school uniforms which are themselves somewhat inspired by naval uniforms (hence the name Sailor) we also see that these outfits existed in the ancient days of Silver Millennium. Is some time travel involved or did these outfits themselves inspire naval uniforms and later school uniforms? So many unanswered questions! Episode 141, Storm of Love: Minako’s Grand Two-Timing Plan, is a great comedic episode. 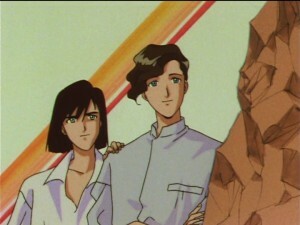 In it we have Minako splitting her interest between two guys she is simultaneously dating, who turn out to be Tiger’s Eye and Hawk’s Eye. This is somewhat funny as Minako has been single throughout the series and now finds herself with two guys at her side. There is a lot of focus on just how terrible what she’s doing is but is it really? The deception she is running on them is not great but ultimately if no insinuation of exclusivity is going on here she’s not doing anything wrong. Artemis seems more upset than anyone but he’s not actually bothered by the two timing. 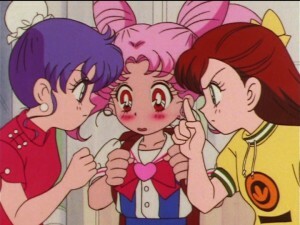 Artemis is clearly in love with Minako and is jealous of any man she may date who isn’t him! Too bad Artemis. That ship sailed the moment your daughter from the future showed up to cement your relationship with Luna, not to mention the events of the Sailor Moon S movie which have them informally beginning their exclusivity. The episode is full of great jokes as Minako has two dates at the same time and runs from one to another. This is cut short as she dumps both of them. For the first and only time two of the Amazon Trio reveal a Mirror of Dreams together, and then they both penetrate her Mirror at once, seeing her lovely dream. 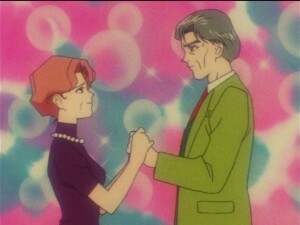 The episode concludes with a lovely romantic scene where Artemis and Minako once again express their strong desire for each other as we see this great couple happy together once again. This marks the beginning of a new ending theme as “Rashiku” Ikimasho or “I’ll Go As Myself” begins playing during the credits of episode 141 and until the end of Sailor Moon SuperS. This replaces “Watashi-tachi ni Naritakute” or “Wanting to Be Together with You” which has played to date. Yet another voice actor has joined the growing list that will be attending the Toronto Sailor Moon Celebration in only 2 weeks on September 27th. Susan Roman, the voice of Sailor Jupiter for the entire series in the original English dub of Sailor Moon, will be joining the previously announced guests at the convention. We previously reported that this one day convention at the Ontario Science Centre would also include Roland Parliament, voice director of the first 65 episodes and the voice of Melvin, Ron Rubin, the voice of Artemis, and Jill Frappier, the voice of Luna. Ammie Cosplay was also recently added to the guest list. Fans are encouraged to wear Sailor Moon cosplay at this event! Tickets to the convention are only $12, $14 including a special collectible bracelet. The bracelets are branded as Sailor Moon Day International as the event was originally going to to take place on Sailor Moon Day 2015. A lot is planned for this events including a number of panels, some of which I will be participating in. I’m coming all the way from the distant land of Gatineau. Surely you can make it out as well! For more details check out Moon Chase! and the Facebook page for the event. Jill Frappier, the voice of Luna from the original English dub of Sailor Moon, will be appearing at a Toronto Sailor Moon Celebration on Sunday September 27th at the Ontario Science Centre. We previously announced that this single day convention would also feature Roland Parliament, voice director for the first 65 episodes and the voice of Melvin, as well as Ron Rubin, the voice of Artemis. There will be a lot going on at this event so be sure to check out Moon Chase! and the Facebook page for the event for more details. Tickets are only $12 ($14 with an exclusive bracelet). I will be in attendance and may be helping out with some panels. I hope to see you there!